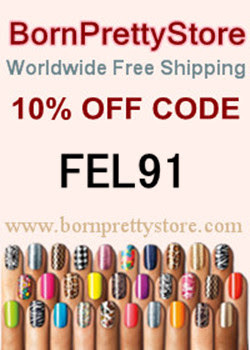 Fashion Footing: Round 27 of Bestie Twin Nails with The Little Canvas! Round 27 of Bestie Twin Nails with The Little Canvas! How is it August and how is it time for another Bestie Twin Nails with Alaina from The Little Canvas?? 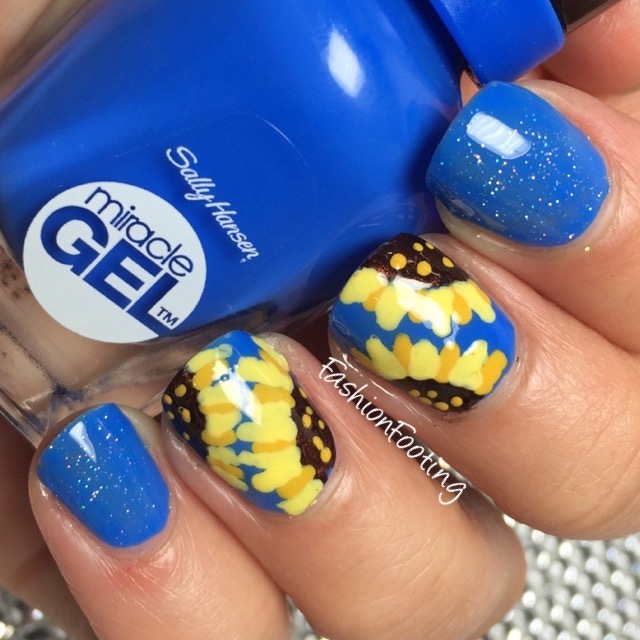 Today we are doing a beautiful sunflower manicure! Sunflowers are my second favorite flower, just behind daisies. Don't you think a giant field of sunflowers is just so happy and friendly to look at? It's my favorite! So I grabbed some of my favorite Sally Hansen polishes and one of my all time favorite China Glaze polishes and got to work. I started with a base of Sally Hansen Byte Blue, a gorgeous cobalt blue creme. I only did one coat because I knew I would be covering most of the nails with other colors or glitter but you do usually need two coats. For the sunflower detail, I took a small brush and outlined the half circle for the center of the sunflower using Cocoa A Go Go. Then using Sally Hansen Butterscotch and Mellow Yellow to alternate the sunflower petals and used Butterscotch to dot the middle of the brown Cocoa A Go Go. So as not to leave the index and pinky nails out, I added one coat of China Glaze Fairy Dust and then topcoat for all the nails. Definitely not my best work but I really like these!